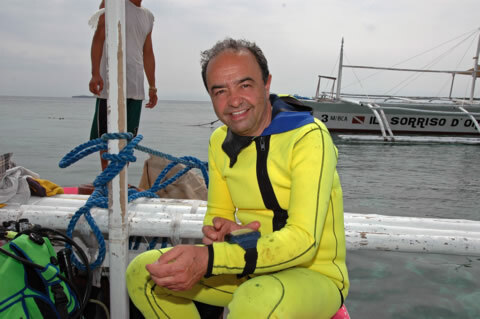 Sergio Sarta was born in Milan and for some years now has been living in Crema, but he has always nurtured a great passion for the sea, particularly for the underwater world, which he began to know like many people through freediving. Later he switched to rebreather scuba diving, which allowed him a more prolonged and intimate contact with the underwater life.The sublime beauty and the enchanting charm of the seabed soon took him to bring underwater that camera he has learned to use with great accuracy in external shots since he was a boy. His twin passions for photography and scuba diving allowed him to explore the wonderful underwater universe and to start a professional activity, which gave him scope to combine his interest as a researcher and journalist with his innate artistic flair. In the 90s he won almost all the important underwater photographic contests in Italy and abroad and quickly became internationally recognized as one of the most well-known specialists in the field of underwater photography.He contributes regularly to various magazines and publications in this area and since 1992 he has worked as special photographic correspondent for the Italian diving magazine SUB dedicated to subaqueous activities, for whom he has taken beautiful photographs in some of the most enchanting seabed sites of the world. In these years he published more than hundred articles, over thousand photos and several covers. In 1996 he published Portfolio, a book of a selection of his underwater photographs, which won the first price at the World Festival of Underwater Pictures in Antibes, France. In 1998 he was invited by the European Union to collaborate on the book The Coral Reefs of Papua Guinea together with the Australian photographers Bob and Dinah Halstead. The book was met internationally with great acclaim. In 2010 a portfolio of his underwater photographs won the title of Italian Champion of Nature Photography.